The Gelepad is a personal comfort pad that delivers instant and long lasting comfort anywhere you experience pain and soreness on your elbows, arms and legs from sitting in one location for extended periods of time. 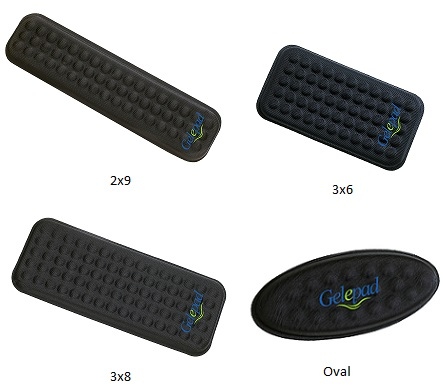 The Gelepad is made from a unique formulation of medical quality gel encased in a soft and resilient fabric that produces the feeling of a soft human muscle, providing the ultimate comfort experience. Think of a baby laying on his mother’s breast, you cannot get more comfortable than that! Gelepads with their place anywhere adhesive backing, lets you to position it specific to your needs, providing instant and long lasting comfort. Gelepads allow you to do whatever you do more comfortably and with less stress and that is always a good thing!! The Gelepads are available in a variety of sizes to easily fit in your vehicle, office or home and are universal in their application. All Gelepads are ½ inch thick, providing the right amount cushion and comfort for even the most demanding pressure point. 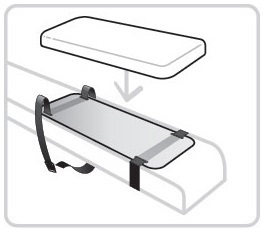 The Gelepad Universal Base provides for a convenient method of attaching the Gelepad to fabric and leather armrest that can have a strap wrapped around it. Contains: 1 each 3 x 8 and 2 x 9 attachment plate and 2 – 16 inch straps with buckle.